Download "Frequent occurrences of basement flooding can result in long-term damage to the building and equipment that may not be covered by insurance." 1 Consumers Avoiding Basement Flooding Is Basement Flooding a Common Problem? 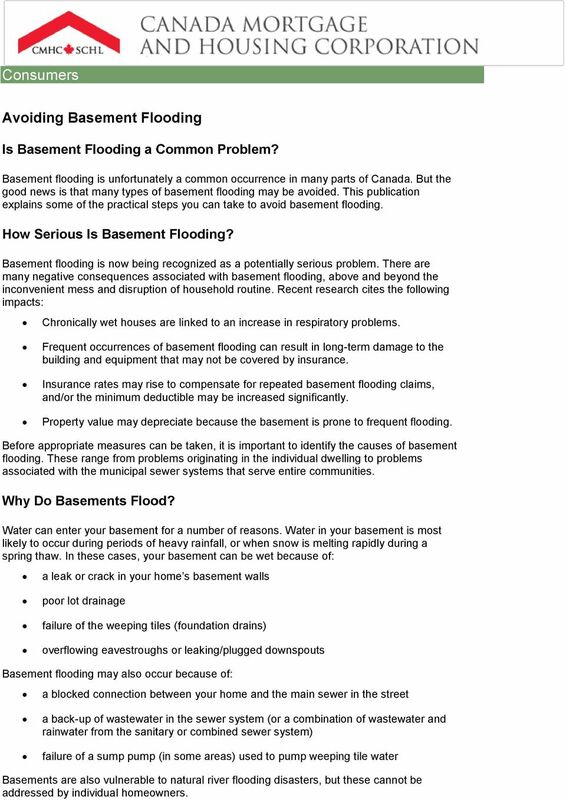 Basement flooding is unfortunately a common occurrence in many parts of Canada. But the good news is that many types of basement flooding may be avoided. 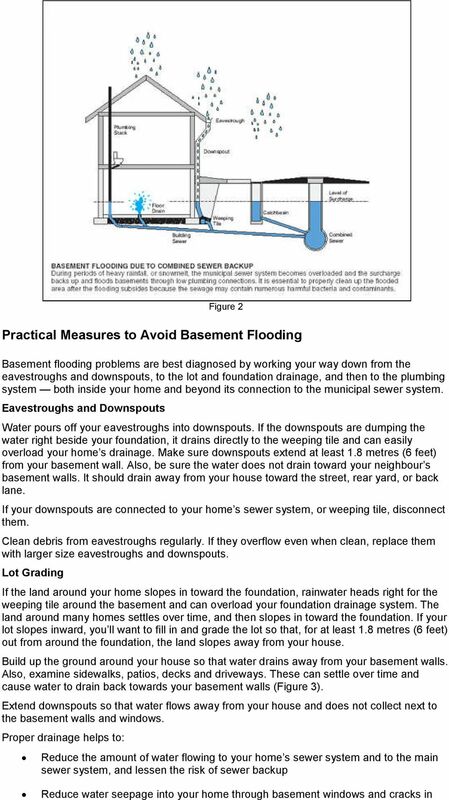 This publication explains some of the practical steps you can take to avoid basement flooding. How Serious Is Basement Flooding? Basement flooding is now being recognized as a potentially serious problem. There are many negative consequences associated with basement flooding, above and beyond the inconvenient mess and disruption of household routine. Recent research cites the following impacts: Chronically wet houses are linked to an increase in respiratory problems. Frequent occurrences of basement flooding can result in long-term damage to the building and equipment that may not be covered by insurance. Insurance rates may rise to compensate for repeated basement flooding claims, and/or the minimum deductible may be increased significantly. Property value may depreciate because the basement is prone to frequent flooding. Before appropriate measures can be taken, it is important to identify the causes of basement flooding. These range from problems originating in the individual dwelling to problems associated with the municipal sewer systems that serve entire communities. Why Do Basements Flood? Water can enter your basement for a number of reasons. Water in your basement is most likely to occur during periods of heavy rainfall, or when snow is melting rapidly during a spring thaw. In these cases, your basement can be wet because of: a leak or crack in your home s basement walls poor lot drainage failure of the weeping tiles (foundation drains) overflowing eavestroughs or leaking/plugged downspouts Basement flooding may also occur because of: a blocked connection between your home and the main sewer in the street a back-up of wastewater in the sewer system (or a combination of wastewater and rainwater from the sanitary or combined sewer system) failure of a sump pump (in some areas) used to pump weeping tile water Basements are also vulnerable to natural river flooding disasters, but these cannot be addressed by individual homeowners. 2 Flooding Basics Municipalities attempt to prevent flooding by maintaining the public sewer system. Homeowners with private sewage systems (septic tank and field bed) can appreciate the need for regular maintenance, but unforeseen or accidental problems can occur in any type of system. This is some municipal infrastructure terminology you should know (Figure 1). Sanitary Sewer Figure 1 A sanitary sewer is a pipe buried beneath the street that is designed to transport wastewater from your home. This consists of water from sanitary fixtures and floor drains inside your house, and in some areas includes groundwater from weeping tiles around the foundation of your home. Storm Sewer A storm sewer is a pipe buried beneath the street that is designed to carry storm-related water runoff. Storm sewers are normally much larger than sanitary sewers because they are designed to carry much larger amounts of flow. 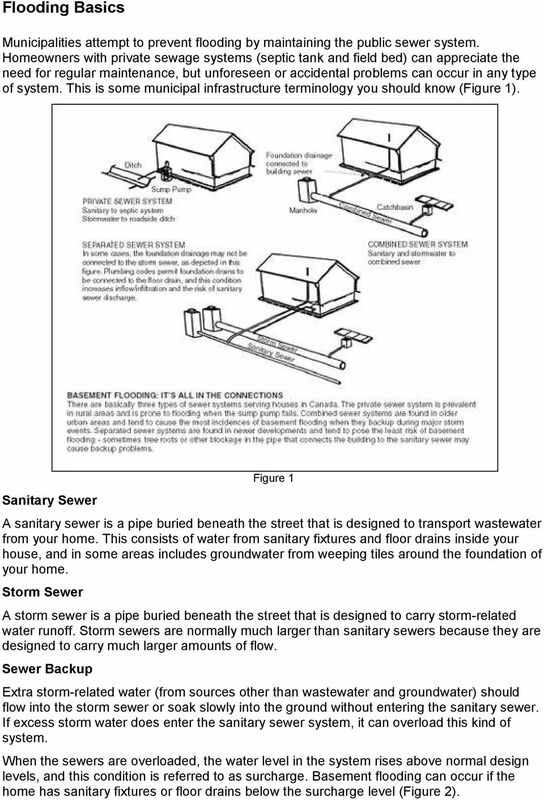 Sewer Backup Extra storm-related water (from sources other than wastewater and groundwater) should flow into the storm sewer or soak slowly into the ground without entering the sanitary sewer. If excess storm water does enter the sanitary sewer system, it can overload this kind of system. When the sewers are overloaded, the water level in the system rises above normal design levels, and this condition is referred to as surcharge. Basement flooding can occur if the home has sanitary fixtures or floor drains below the surcharge level (Figure 2). 4 your basement walls. Keep the moisture content of the soil around and under your house stable to reduce the chances of cracking and shifting. If water collects next to your basement, it can make its way to the footings that support the basement walls. The increased moisture may cause the footings to heave or settle Extend the life of your sump pump by reducing the amount of work it has to do. Be sure that any drainage improvements you make do not cause water to flow onto your neighbour s property. 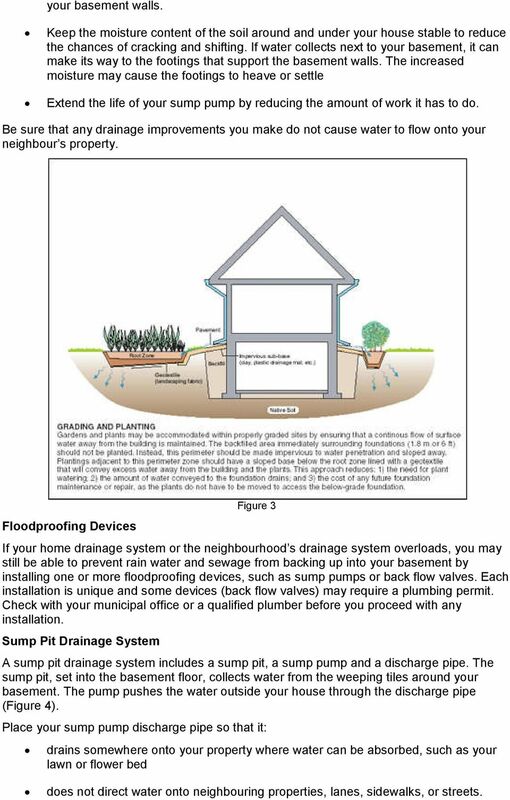 Floodproofing Devices Figure 3 If your home drainage system or the neighbourhood s drainage system overloads, you may still be able to prevent rain water and sewage from backing up into your basement by installing one or more floodproofing devices, such as sump pumps or back flow valves. Each installation is unique and some devices (back flow valves) may require a plumbing permit. Check with your municipal office or a qualified plumber before you proceed with any installation. Sump Pit Drainage System A sump pit drainage system includes a sump pit, a sump pump and a discharge pipe. The sump pit, set into the basement floor, collects water from the weeping tiles around your basement. The pump pushes the water outside your house through the discharge pipe (Figure 4). Place your sump pump discharge pipe so that it: drains somewhere onto your property where water can be absorbed, such as your lawn or flower bed does not direct water onto neighbouring properties, lanes, sidewalks, or streets. 6 backup will be stopped and not come out through other outlets in your basement, such as sinks, toilets, showers and laundry tubs. Make sure that you can get at the valve at all times. Check the valve regularly and remove any material that may prevent the valve from operating properly. You will normally require a permit and inspection to install a backwater valve and sump pit. Since part of the basement floor will be dug up and since proper placement of these items is important, we recommend that you use a qualified plumbing contractor. Plumbing Fixture Maintenance Figure 5 Have a qualified plumber inspect all floodproofing devices and plumbing fixtures (i.e. 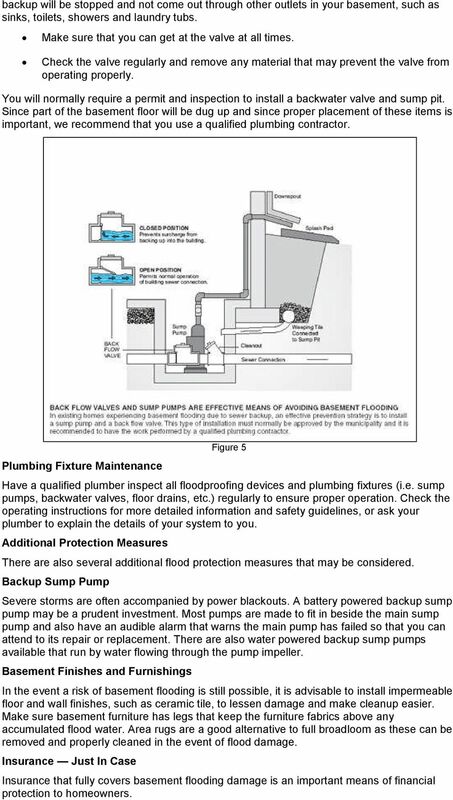 sump pumps, backwater valves, floor drains, etc.) regularly to ensure proper operation. Check the operating instructions for more detailed information and safety guidelines, or ask your plumber to explain the details of your system to you. Additional Protection Measures There are also several additional flood protection measures that may be considered. 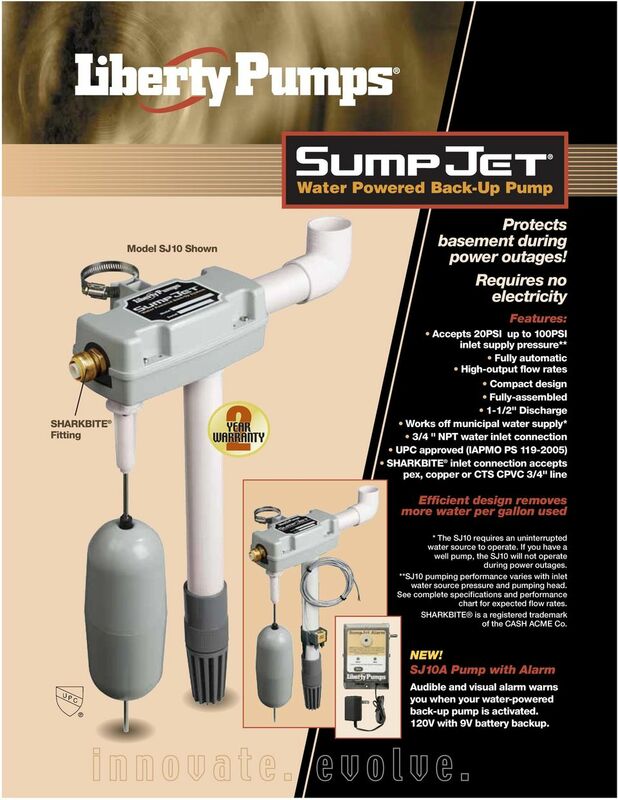 Backup Sump Pump Severe storms are often accompanied by power blackouts. 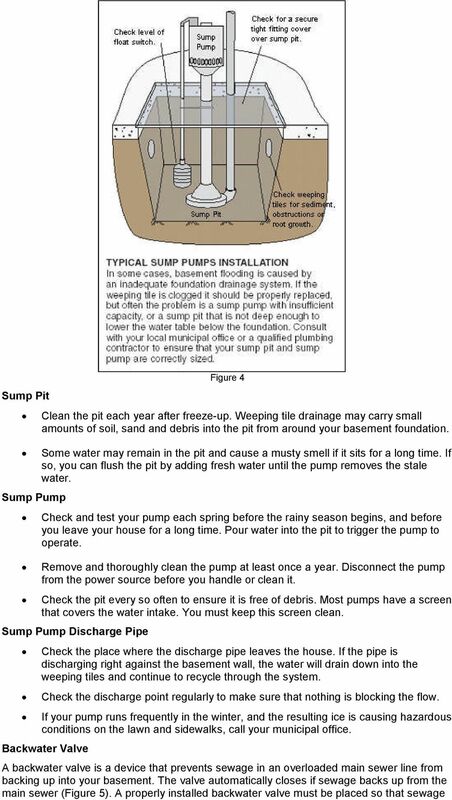 A battery powered backup sump pump may be a prudent investment. Most pumps are made to fit in beside the main sump pump and also have an audible alarm that warns the main pump has failed so that you can attend to its repair or replacement. There are also water powered backup sump pumps available that run by water flowing through the pump impeller. Basement Finishes and Furnishings In the event a risk of basement flooding is still possible, it is advisable to install impermeable floor and wall finishes, such as ceramic tile, to lessen damage and make cleanup easier. Make sure basement furniture has legs that keep the furniture fabrics above any accumulated flood water. Area rugs are a good alternative to full broadloom as these can be removed and properly cleaned in the event of flood damage. Insurance Just In Case Insurance that fully covers basement flooding damage is an important means of financial protection to homeowners. 7 Most policies include or can include coverage for damage caused by sewer back-up. Make sure your policy includes sewer back-up insurance. Check regularly with your insurance agent or broker to ensure you have appropriate and adequate insurance coverage, including any extensions in coverage that may be available, which were not previously attached. Keep a detailed inventory of your residence. It will be invaluable in the event of loss. Make sure your insurance policies and related records are in a safe location and easily available after an emergency or disaster event. Sources of Information Additional sources of information related to basement flooding are listed below. Always check with your local municipality or plumbing inspection department for the latest information on basement flood protection. 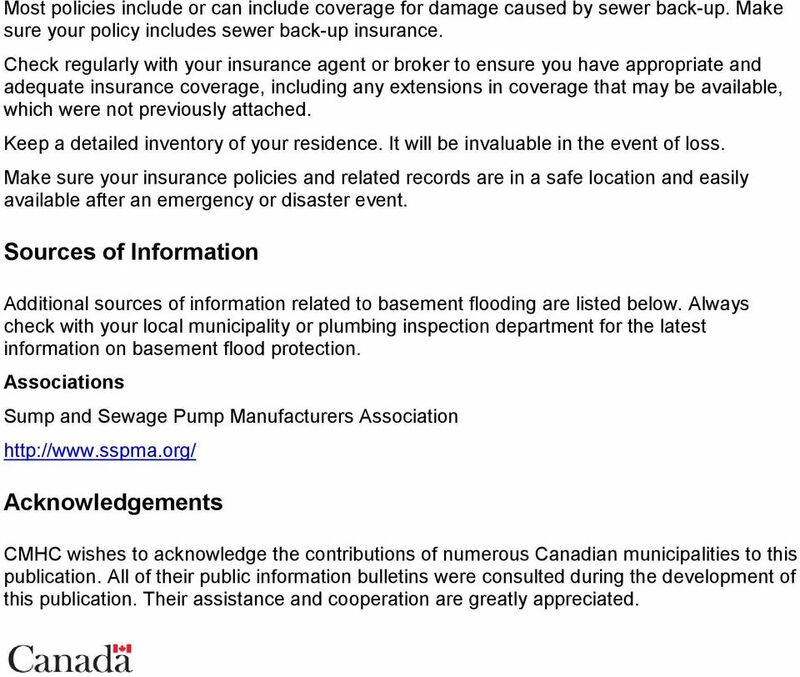 Associations Sump and Sewage Pump Manufacturers Association Acknowledgements CMHC wishes to acknowledge the contributions of numerous Canadian municipalities to this publication. All of their public information bulletins were consulted during the development of this publication. Their assistance and cooperation are greatly appreciated. 8 SHARKBITE Fitting Model SJ10 Shown Protects basement during power outages! Requires no electricity Features: Accepts 20PSI up to 100PSI inlet supply pressure** Fully automatic High-output flow rates Compact design Fully-assembled 1-1/2" Discharge Works off municipal water supply* 3/4 " NPT water inlet connection UPC approved (IAPMO PS ) SHARKBITE inlet connection accepts pex, copper or CTS CPVC 3/4" line Efficient design removes more water per gallon used * The SJ10 requires an uninterrupted water source to operate. If you have a well pump, the SJ10 will not operate during power outages. **SJ10 pumping performance varies with inlet water source pressure and pumping head. 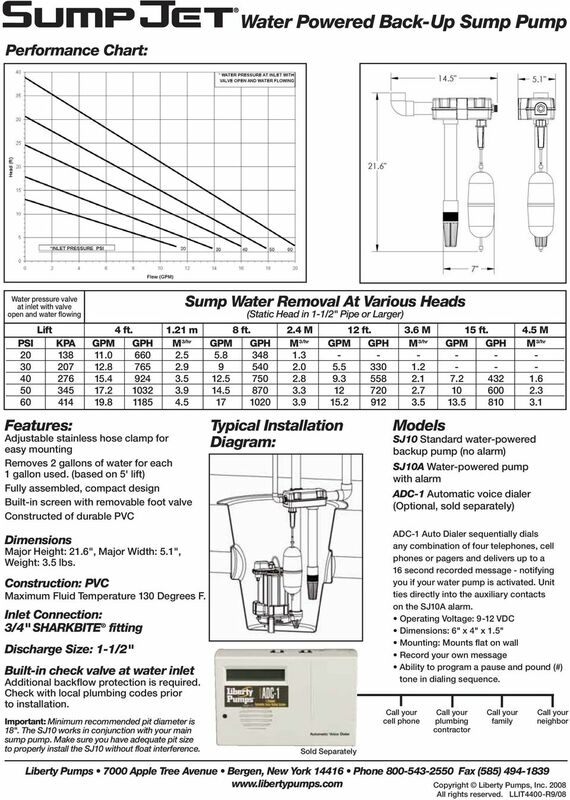 See complete specifications and performance chart for expected flow rates. SHARKBITE is a registered trademark of the CASH ACME Co. NEW! SJ10A Pump with Alarm Audible and visual alarm warns you when your water-powered back-up pump is activated. 120V with 9V battery backup. The Top FAQ s on. Home Insurance. Will my Homeowner s or Tenant s insurance in Calgary cover damage caused by a flood?